A low-intensity diplomatic war is simmering in West Africa, with the governments of Guinea and Senegal becoming increasingly petty in demonstrating their mutual dislike. On Monday Guinean President Alpha Condé, has recalled his ambassador to Senegal, state media reported. The presidential decree was published Monday by the RTG (Radio Television Guinéenne), Guinea’s national TV channel. The RTG gave no further details regarding the reasons behind Condé’s diplomatic move. 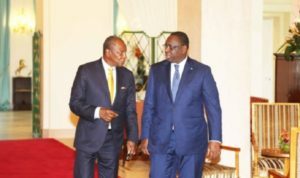 Relations between Presidents Macky Sall and Alpha Condé are very tense, because of the management of some regional issues, including the Ebola crisis of 2013 and departure of Yahya Jammeh. There is also the question of Guinean domestic politics, since some believe that the Guinean opposition leader, Cellou Dalein Diallo, is supported by Macky Sall. 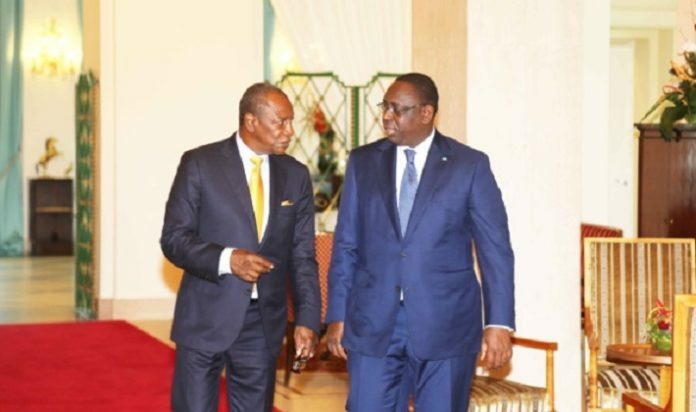 Also, according to local newspaper reports, the Senegalese Head of State is has been accused by Conakry for showing a support to Alpha Condé’s main opponent, Cellou Dalein Diallo during the last presidential election in Guinea. As a reminder, in 2011, a year after Conde’s first election, the Senegalese government has banned any planes traveling to or from Guinea from using Senegalese airspace. Posted by Emmanuel Agbenonwossi on August 16, 2018. Filed under News. You can follow any responses to this entry through the RSS 2.0. Both comments and pings are currently closed.